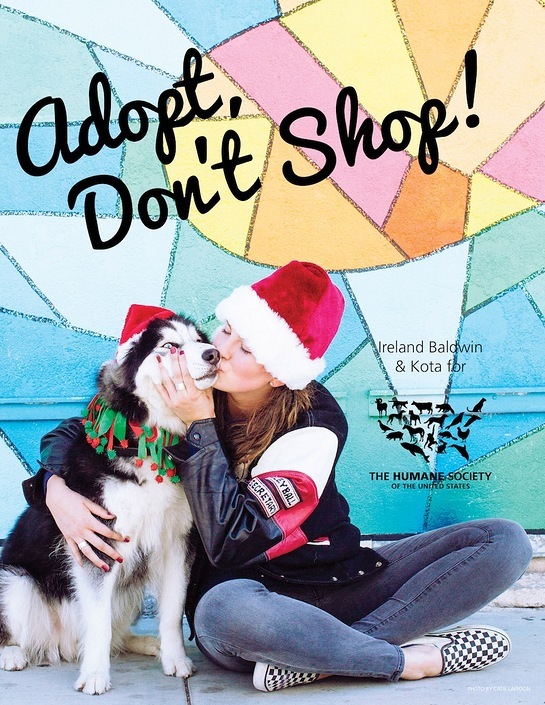 Model Ireland Baldwin has teamed up with The Humane Society of the United States to urge her fans to adopt a shelter pet this holiday season. In a colorful new Christmas-themed ad Baldwin is shown planting a kiss on her rescued pup Kota. A passionate advocate for animals, Baldwin is asking her fans to consider adopting a pet, as most pet store puppies come from puppy mills, and puppy millers pose as small, local breeders online. Puppy mills are inhumane, commercial dog-breeding facilities where dogs are typically kept in small wire cages for their entire lives, are given very little food and water and often do not receive veterinary care. They are usually bred continuously and are discarded or killed when they can no longer breed anymore. Baldwin is part of a long list of celebrities—including Ian Somerhalder, Kaley Cuoco, Kesha, and Jenna Dewan Tatum — who have teamed up with The Humane Society of the United States to promote animal protection. Visit StopPuppyMills.org for more information.